I wasn't really invested in my skincare until the fall of 2015 (a year before our wedding) when I made it my goal to take care of my skin so I could have glowing, goddess skin on my big day. Now I'm addicted to my multi-step skincare regimen. It's a relaxing ritual I look forward to every night before bed. And yes, while a majority of my routine contains high-end or luxury products, I've come to the realization that I'd rather splurge what I'm putting into my skin (skincare) than what I put on my skin (makeup). 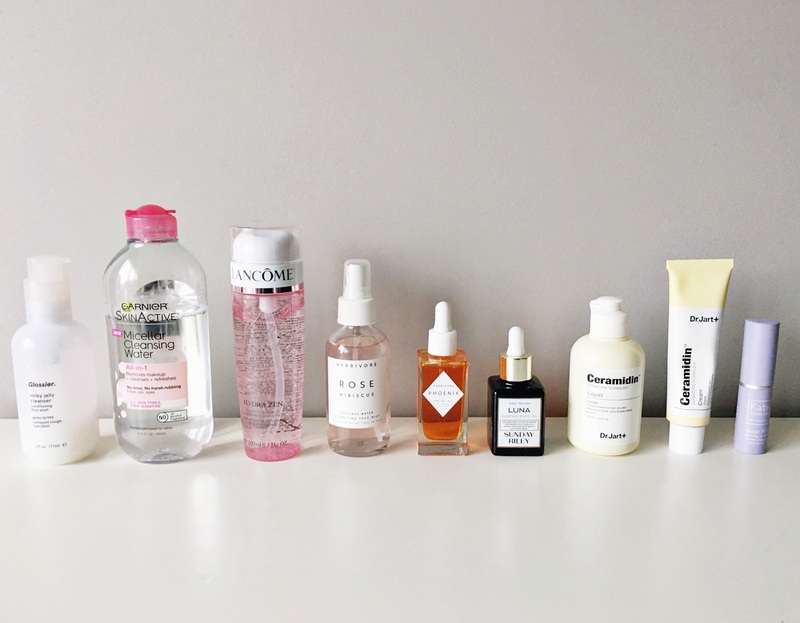 So what's in my current skincare routine and why do I love these products so much? Here they are in all their glory (FYI: I have mostly dry skin with a slightly oily t-zone). Glossier is hyped up all over the Internet right now, but it's for a good reason. I can't speak for any of the makeup products, but this is one of the best semi-affordable high-end cleansers I've tried (it's only $18). I prefer a jelly-textured cleanser that doesn't foam up when it's massaged into the skin. Something about the foam from other cleaners makes my skin feel dry and irritated. The Milky Jelly Cleanser is perfect because it can be used dry (for a first cleanse) and wet (for a second cleanse). There's no obnoxious scent, frou-frou packing, and other nonsense. Just good, clean, effective ingredients. 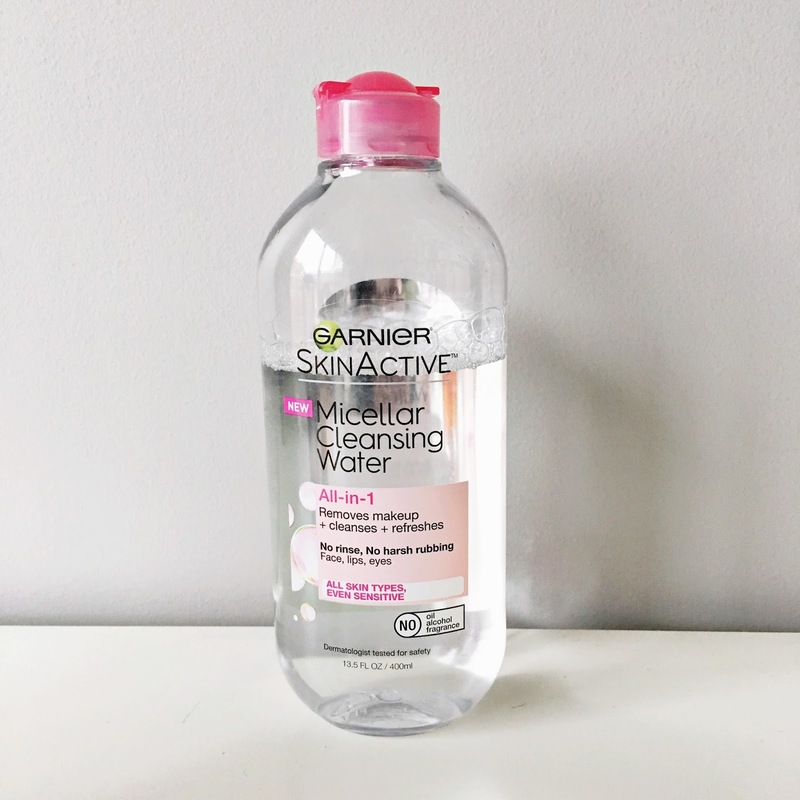 This is my absolute holy grail micellar water. I've literally used 10 bottles of this stuff in the past year - not even exaggerating. I love using this after I've washed my face to get any bits of makeup and dirt that I may have missed. I love using this with the square cotton "pillow pads" you can get at the drugstore! This is a newer addition to my skincare routine based on a recommendation from Estee LaLonde. I'm not 100% convinced that it makes a huge difference in my skin, but it do love the extra layer of hydration this gives. The smell of this product lives up to it's name - its calming rose scent is the perfect treat in the morning or before bed. I feel so luxe when I use this facial mist. The heavy glass bottle looks gorgeous on my vanity, and the product inside is just as fabulous. This is a great next step after my Lancome essence, as they both have a calming rose scent. The coconut and rose water in this facial mist adds that extra layer of moisture that my skin constantly craves. I'm tempted to purchase the smaller sized bottle to keep on my desk at work for a little pick-me-up in between meetings. This has quickly become my new favorite daytime facial oil. It has amazing ingredients - like Rosehip Oil, Sea Buckthorn Oil and Jojoba Oil - that leave my skin feeling radiant all day. What I love about this (over the Sunday Riley daytime oils) is the light scent. It's slightly herbal, but nothing overpowering. It absorbs quickly and pairs beautifully with the rest of my skincare routine. This is another beauty guru-hyped product that really deserves all its praise. I notice a huge difference in my skin when I forget to use this oil at night. Even after one use, I saw a more youthful, radiant glow to my skin. Don't be confused by the name - this is actually a retinoid treatment suspended in blue tansy and German chamomile essential oils so you DO NOT want to use this during the day under your makeup. This is another newer addition to my skincare routine and I though I'd give it ago because I'm absolutely mad for the Dr. Jart+ Ceramidin Cream (see below). So far, so good! Same lovely citrus scent as the cream, same AMAZING hydration. If you're a dry-skinned gal, I 100% recommend this line from Dr. Jart+! HOLY GRAIL STATUS. This cream is so worth the splurge. If you have normal to dry skin and love to be hydrated throughout the day, this moisturizer belongs on your bathroom counter. What I love is that this cream is build-able, so if I'm feeling extra dry I'll layer it a couple times at night and wake up with the most pump, soft skin. I love the subtle citrus scent - it's so calming. This truly is a miracle product! If you love that cool feeling you get from those fancy under-eye patches, you'll love this eye cream. Now, I don't have dark under eyes or extreme texture or lines so I can't speak to how this product works for those concerns, but it's the perfect light, hydrating under eye cream/balm. I love the packaging - it's so convenient to twist up the product, swipe under the eyes, and twist down. It sets beautifully under makeup and keeps my eyes bright and hydrated all day. And who can resist that lavender packaging!? I let all these miraculous products sink into my skin for 15-20 minutes before I apply my makeup, so all the good ingredients have time to soak in. Have any questions about these products? Or think there's something out there I would love? Tweet me and let's chat! FTC Disclaimer: This post contains affiliate links, which means that if you click on one of the product links and purchase the product, I’ll receive a small commission. I want to try the Herbivore line.